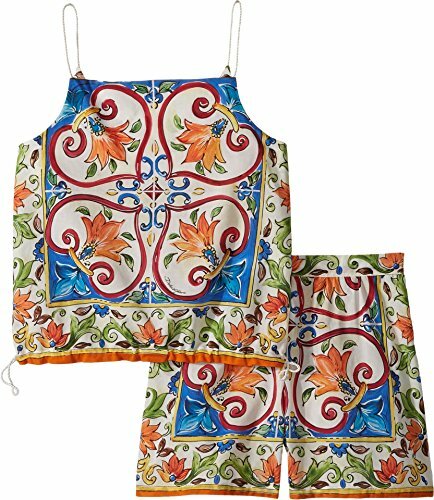 Give her a chic new look with the Dolce & Gabbana Kids™ Dress No Sleeve+Pants. Square neck pant set. Rope shoulder straps. Pull-on style with drawstring hemline. Floral print throughout. Back stretch pant with matching design. Flowing, straight hemline. 100% cotton. Machine wash cold, tumble dry low. Imported. This item may ship with an attached security tag. Merchandise returned without the original security tag attached or a damaged tag may not qualify for a refund. Measurements: Length: 20 in Waist Measurement: 26 in Outseam: 13 1⁄2 in Inseam: 4 in Front Rise: 10 in Back Rise: 12 in Leg Opening: 11 in Product measurements were taken using size 12 (Big Kids). Please note that measurements may vary by size. Give her a chic new look with the Dolce & Gabbana Kids™ Dress No Sleeve+Pants. Pull-on style with drawstring hemline.